Waste management company Indaver has entered into an agreement with Gent Fairhead & Co Limited (GFC), to work together on the final developmental stages of a proposed Integrated Waste Management Facility (IWMF) in Rivenhall. Using its broad experience from over 30 years in the sector, Indaver will now work alongside GFC in finalising the detailed design; planning and permitting of the facility to enable this major investment in Essex. Once the necessary permits are finalised, construction is planned to commence in Summer 2019. 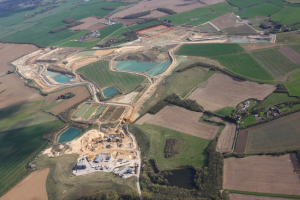 The Rivenhall facility, set to be built in the footprint of a quarry on a former airfield, will produce renewable electricity and divert waste from landfill and provide an alternative to the export of waste. The IWMF will also provide employment opportunities in construction and operation. In addition, the project will include the refurbishment of the derelict 17thcentury Woodhouse Farm. The proposed facility will contribute to the circular economy through a maximum recovery of energy and valuable materials from waste. By incorporating a 49 MW Energy from Waste facility, the proposed Rivenhall IWMF will not only work alongside recycling efforts made by the local community and therefore benefit the facility’s surrounding area. But it will also supply enough electricity to power over 60,000 homes, equivalent to a town the size of Braintree. Indaver operates waste recovery and treatment facilities at more than 30 locations in Belgium; Germany; Holland; Ireland; Italy and Portugal, managing more than 5 million tonnes of waste each year. The company continues to provide a positive, sustainable alternative to landfill disposal in support of a low carbon economy. Indaver covers the full waste hierarchy, from waste prevention to re-use; recycling; recovery and disposal, employing over 1,700 people across Europe. GFC owns the Rivenhall Airfield site and has received planning permission from Essex County Council and a permit to operate from the Environment Agency. Final modifications are currently being sought.